Well, if you are The Electric Cheetah, it’s unique and eclectic, and it probably leaves you wondering, “What the heck is this place? !” The answer to that question is simple: it is a quaint, whimsical restaurant that gives diners a local farm-to-table experience – not to mention a choice of over 40 craft root beers! 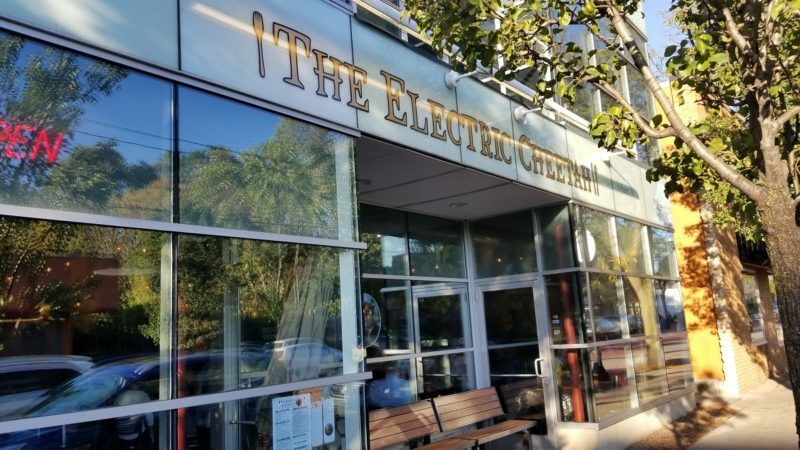 The “Kitchen of the Electric Cheetah” continued as a catering business until eight years ago, when DeMint opened his restaurant with a shortened name – The Electric Cheetah. The Electric Cheetah is an eclectic place situated in the heart of Eastown. The convenience of its location draws people in from all over the Grand Rapids area, but locals refer to it as their “neighborhood restaurant.” Walking in to recharge on the delicious comfort food, guests know they can find something to enjoy every day of the year except Thanksgiving and Christmas – now that’s service! When I entered The Electric Cheetah, it was anything but ordinary… it was FUN! Majestic murals adorn the walls, kind of “jungle meets dinner crowd.” Did I mention this place is just a little eccentric? Yes, there is a painting of a cheetah with a mustache, and one wearing a business suit, but hey, isn’t that what makes life fun and interesting? And I can’t forget to mention all of the lights that hang from the ceiling; they are electric! Because I eat mostly vegetarian, I decided to try the Singing Eggplant. Each bite of this cornmeal-encrusted eggplant was heavenly, and it was perfectly complemented by grilled asparagus and Portobello mushrooms, olive oil, garlic, Roma tomatoes, and fresh mozzarella. The basil, balsamic reduction, and sea salt were the perfect way to finish off this dish. My husband the meat lover decided on the I’m Not My Brother’s Sandwich: grilled chicken topped with bacon, provolone cheese, Thousand Island dressing, and tomatoes, all sandwiched between grilled sourdough bread garnished with asiago cheese butter. Wait! Did I mention the hand-cut fries with aioli dip? OH. MY. GOSH! They are incredible. At this point, if you can manage to eat anything else, you must order the Milk and Cookies. The freshly baked melt-in-your-mouth monster-sized cookies will have you dreaming you’re five years old again and sitting at your mother’s kitchen table. If you want an answer to whatever your appetite is looking for, be sure to also check out The Electric Cheetah’s “Happy Family” of restaurants: The Old Goat, Uncle Cheetah’s Soup Shop, and Auntie Cheetah’s Soup Shop. You can thank me later!